I really should throw this away. The cover has tears, wrinkles, and a scribble from a blue ballpoint. It's missing some pages. Someone actually cut out half a page (Perhaps for the pint-size, do-it yourself X-Mas cards?) and three pieces of tape appear to be holding the book together. It looks like somebody stepped on it and gave it to a small dog as a chew toy. 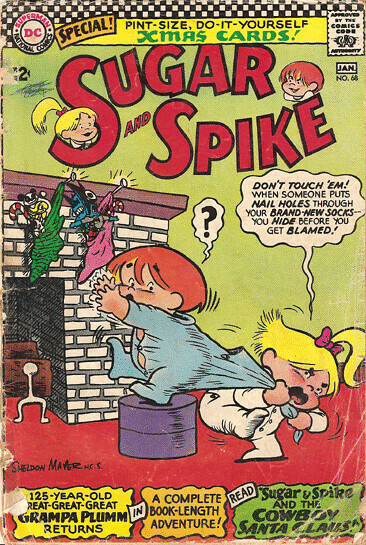 However, it's the only issue of Sugar and Spike I own and I'm keeping it. Spike cleaned up that Christmas. Batman, Robin, and a Batmobile! I like Sugar & Spike a lot! I have a bunch of the issues, including some of the digest reprints. There IS a hardcover reprint out from DC. Volume 1 was released last September.